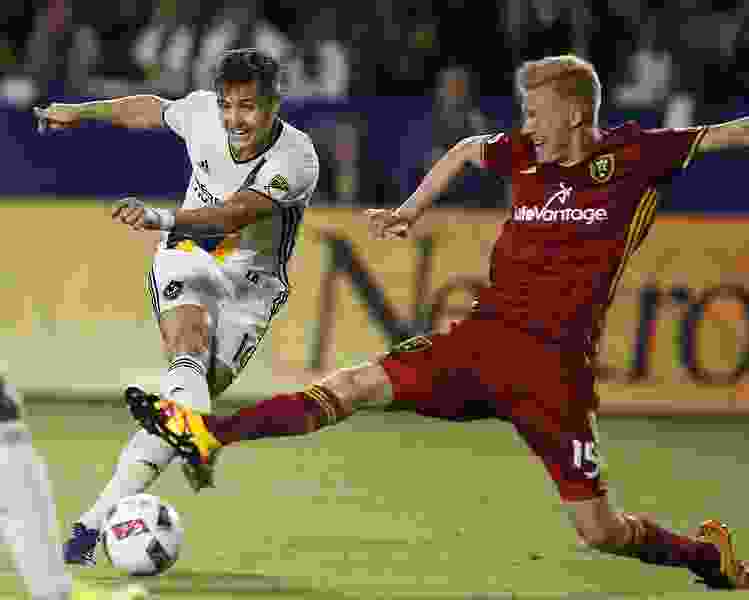 (Associated Press File Photo) Real Salt Lake defender Justen Glad, right, stops a shot by Los Angeles Galaxy forward Robbie Rogers, left, during an MLS playoff soccer match in Carson, Calif., Oct. 26, 2016. Galaxy won 3-1. One of the producers of The CW’s new series “All American” — a show about a high school football player — has vivid memories of playing soccer at Rio Tinto Stadium in Sandy. All opposing soccer players get heckled when they’re on the road; Rogers got homophobic slurs thrown at him after he came out in 2013 and joined the Galaxy. Including in Rio Tinto Stadium. (Associated Press File Photo) Los Angeles Galaxy forward Robbie Rogers is shown during an MLS soccer game in Commerce City, Colo., in this March 12, 2016, file photo. Rogers, who became the first openly gay male athlete in a major North American professional sport, retired from soccer in 2017. He brushed off a lot of the heckling. “It was [fans] trying to get under your skin, like they do with every player,” he said. “So a lot of times I would just get on with it. But there were a few times when it got out of hand. Rogers officially retired from the Galaxy a year ago, although, due to injuries, he last played in 2016. He’s since joined the family business — “All American” is produced by his husband’s company. That would be uber producer Greg Berlanti, whose current crop of shows includes “Arrow,” “Black Lightning,” “DC's Legends of Tomorrow,” “The Flash,” “Riverdale” and “Supergirl” on The CW; “God Friended Me” on CBS; “Blindspot” on NBC; “The Chilling Adventures of Sabrina” on Netflix”; “You” on Lifetime; and “Titans” on DC Universe. Rogers helped develop “All American” (Wednesdays, 8 p.m., CW/Channel 30), which is based on the life of former NFL player Spencer Paysinger, who grew up in South Central and played football for Beverly Hills High. And the soccer player and the football player quickly hit it off. Rogers is a non-writing producer on “All American,” although he’s often in the writers room. And he’s involved in all aspects of the production. The one thing he has no plans to do is add “All American” to his short list of acting credits, which includes an appearance as himself in an episode of the sitcom “The Real O’Neals” and a very small part as a soccer coach in the film “Love, Simon,” which Berlanti directed. And that's what he hated about it. And Rogers acknowledged that it's “weird” that he has such an aversion to taking on even minor roles on camera. “I’ve been in the spotlight in soccer for a long time, but I much prefer to be in the writers room or production meetings or whatever,” he said.